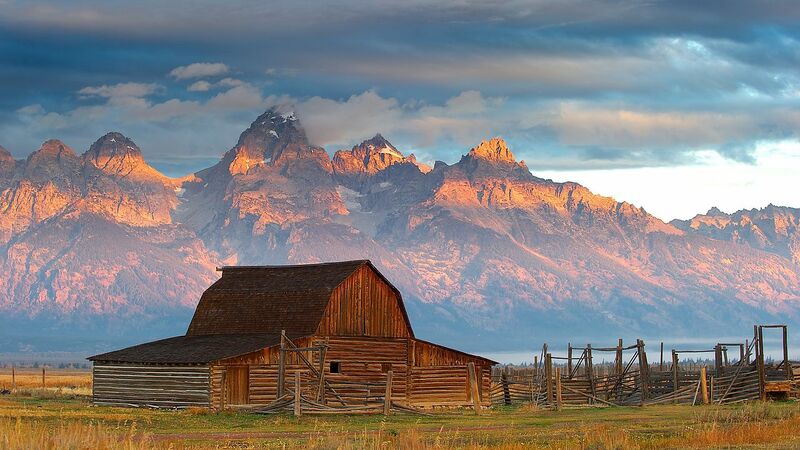 Search results for "michael lehrer"
We invest in a clean and competitive U.S. economy that is powered by renewable energy through cost-effective and innovative solutions. This creates jobs and lowers the costs of living and doing business. We stand up to the influence of special interest money in politics to create a truly level playing field. Subsidies for renewable energy technologies should be equal to the many hidden and costly subsidies that support fossil fuels and nuclear energy. Alternatively, all subsidies across all energy sources should be removed in their entirety. We re-affirm America’s commitment to addressing climate change through the continued participation in the historic Paris Climate Agreement. Gary Lee Moore is the city engineer with the Los Angeles Bureau of Engineering, one of the many organizations and agencies involved in the ongoing restoration and redevelopment of the Los Angeles River. Among the numerous river-related projects on which the bureau is currently working are the restoration of an 11-mile run of the river within city limits and the replacement of the Sixth Street Viaduct with new designs by Michael Maltzan Architecture. The Architect’s Newspaper: What role does the L.A. Bureau of Engineering play in facilitating the ongoing L.A. River restoration process? Gary Lee Moore: The Bureau of Engineering (BoE) has a long history of working on the Los Angeles River. We led the development of the L.A. River Revitalization Master Plan, passed by the Los Angeles City Council in 2007, and were assigned the responsibility of implementing the plan, which continues today. BoE also led the city’s collaboration with the United States Army Corps of Engineers on the development of the Los Angeles River Ecosystem Restoration Feasibility study and the Alternative with Restoration Benefits and Opportunities for Revitalization (ARBOR) study that recommended Alternative 20 (the policy recommendation that called for the most expansive level of restoration for the river). Alternative 20 was adopted by the city council in June 2016 and is pending approval in Congress. 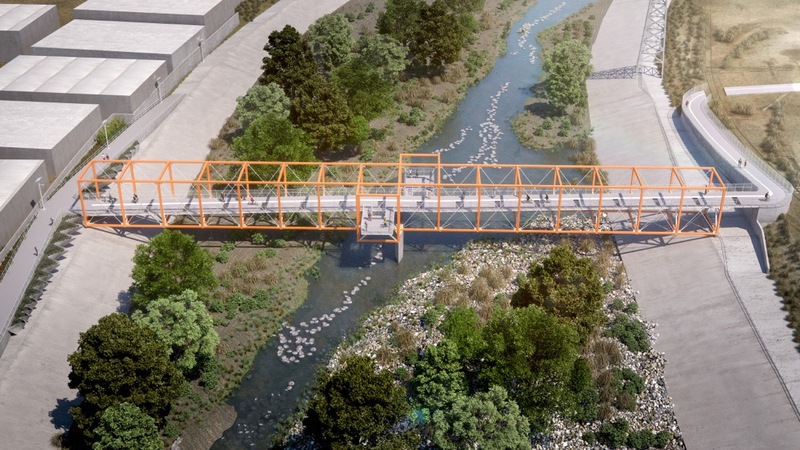 BoE is also managing a variety of significant L.A. River projects that include new bikeways, river-adjacent parks, bridges that cross the river, and bridge underpasses, as well as restored river-access points and existing bridges. For our regional colleagues who are also focusing on river revitalization, BoE has been the city’s point of collaboration. This includes a variety of nonprofits and other public agencies. How does the L.A. River restoration feed into the BoE’s overall mission? 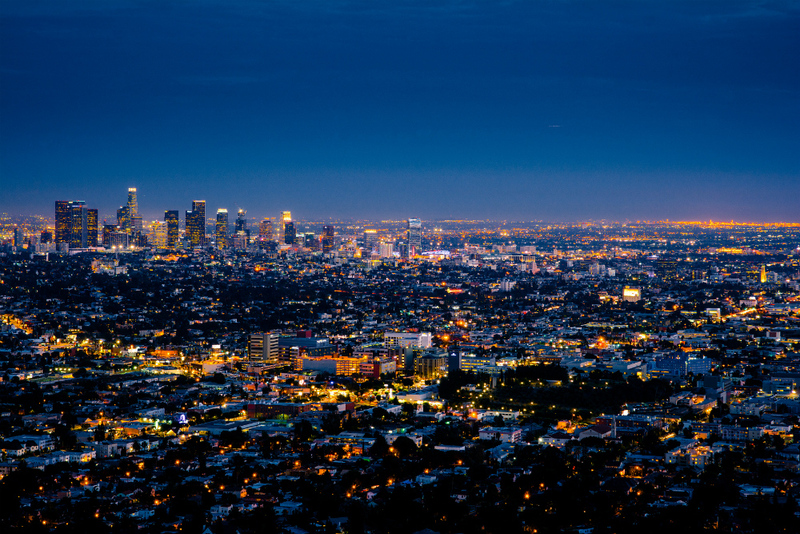 BoE’s vision is to transform Los Angeles into the world’s most livable city. 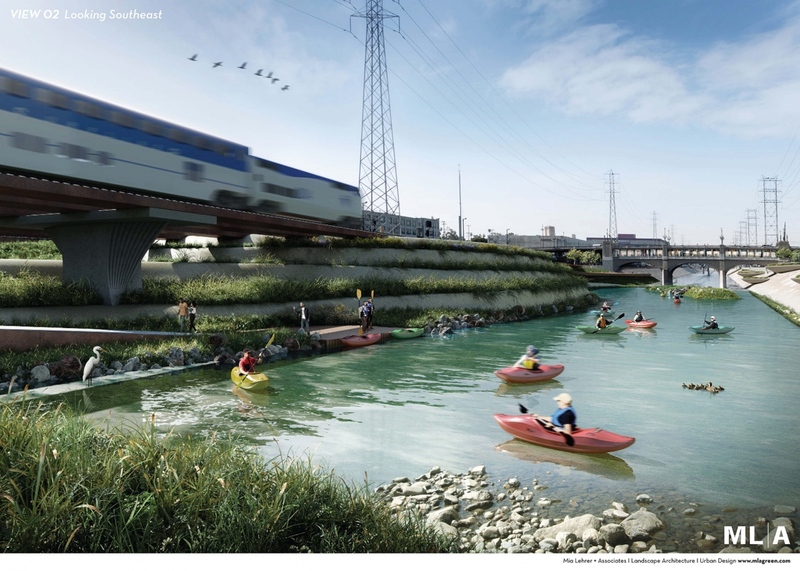 Revitalization of the Los Angeles River corridor, with public access, open space, native ecosystem restoration, and world-class parks, will contribute to creating a more livable, more sustainable Los Angeles. What are some of the approaches being taken with regard to maintaining the river’s usefulness as a piece of flood control infrastructure for the region? The ARBOR study assumed that current levels of flood protection would be maintained with the suggested changes to the river. For example, this means increasing the flood channel’s capacity where planting is suggested in the channel for habitat creation. Which measures are being taken to guide forthcoming development along the L.A. River toward having a more positive relationship with the local hydrology and ecology (in terms of runoff, infiltration, sewage, etc.)? The city established a citywide Low Impact Development ordinance in 2012 that requires on-site capture or infiltration and a dispersed approach to stormwater management that positively diverts it to the L.A. River. In addition, recent projects done by the city along the L.A. River have been designed to direct stormwater into vegetated swales. The River Improvement Overlay (RIO) guidelines produced by the Department of City Planning in 2014 provide private property owners along the river with design approaches that reflect habitat sensitivity. In terms of ecology, the city uses Los Angeles County’s L.A. River Master Plan Landscaping Guidelines and Plant Palettes, published in 2004, which calls for a native L.A. River plant palette all along the river. This palette was identified to support local fauna and to restore the native landscape. 2016 has been big for the Los Angeles River’s ongoing restoration process, as several of the multi-agency, intragovernmental urban water infrastructure projects surrounding its redevelopment have begun implementation. The 51-mile-long concrete channel currently known as the L.A. River was created in 1938 as a flood control measure, and has been the site of steadily growing public interest for decades. Activist groups started gathering around the idea of river as a social justice cause for the city back in the 1980s, exploring its hidden potential for creating an urban oasis. River-focused landscape architects like Mia Lehrer and organizations like Friends of the Los Angeles River (FoLAR), founded in 1986 by poet, filmmaker, and writer Lewis MacAdams, have been at the forefront of river advocacy for years and are responsible for keeping the river in the public eye. But suddenly, the project has gained international notoriety both as the poster child for the post-World War II era’s ham-handed approach to urban hydrology, and, crucially, as an urban project the success of which could rewrite the future of America’s second-largest city. In 2004, the City of Los Angeles founded a nonprofit group, L.A. River Revitalization Corporation, to wrangle the ever-growing constellation of river-related programs, and ultimately hired Frank Gehry and Associates, landscape firm OLIN, and Geosyntec Consultants to create a master plan. The team is currently in the midst of working through the initial study phases and has held a handful of community meetings across the region to discuss on-the-ground concerns and to gather ideas, in the process creating the L.A. River Index, an online resource for sharing information with the public. A preview of the L.A. River VR Experience, an initiative by media producers Camilla Andersson and Anders Hjemdahl at Pacific Virtual Reality and FoLAR, was released on October 8, timed with the organization’s 30th anniversary. The project is currently in the final stages of production and features a VR tour along the entire LA River. Additionally, Gruen Associates, Mia Lehrer Associates, and Oyler Wu Collaborative were recently selected to design bike paths across the river’s length in the San Fernando Valley. Their project will link to the existing, popular path along the river running through the Frogtown neighborhood just north of Downtown Los Angeles. That particular area has been the site of highly partisan anti-gentrification battles, as the development community quickly began to take note of an impending windfall if the river becomes a desirable location. Housing projects have begun to sprout up around this neck of the river, which is surrounded by a mix of sleepy residential and industrial areas. A forthcoming project by Rios Clementi Hale Studios aims to bring 419 apartments, 39,600 square feet of ground-floor retail space, and 18 acres of open space to a river-adjacent site. 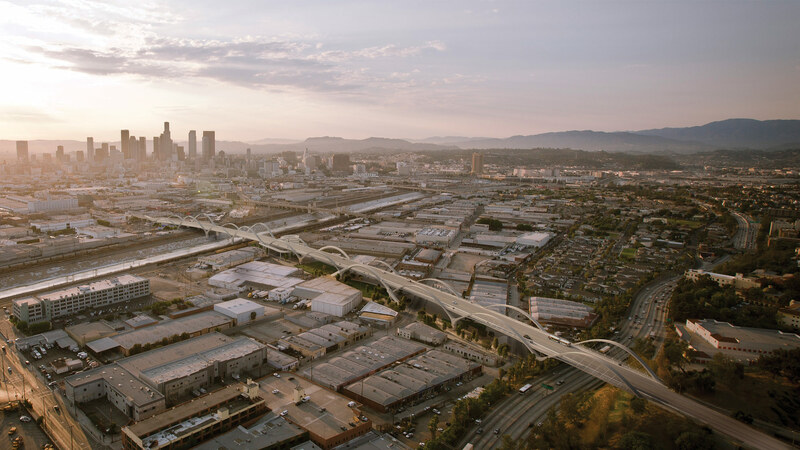 In Downtown Los Angeles, Michael Maltzan Architecture (MMA) is working toward beginning construction on their new vision for the Sixth Street Viaduct. The project will replace a structurally compromised bridge from 1932 currently under demolition. MMA aims to work in parallel with the bridge’s demolition, starting construction at the recently demolished eastern banks of the river and moving in the path of the old bridge. That project, a partnership with the City’s Bureau of Engineering, is being designed explicitly to facilitate community access to the river along both banks, and is due to be completed in 2019. Whether it’s online, in virtual reality, or along the newly permeable banks of a beautified L.A. River, one thing is sure: L.A.’s River is changing very, very quickly. 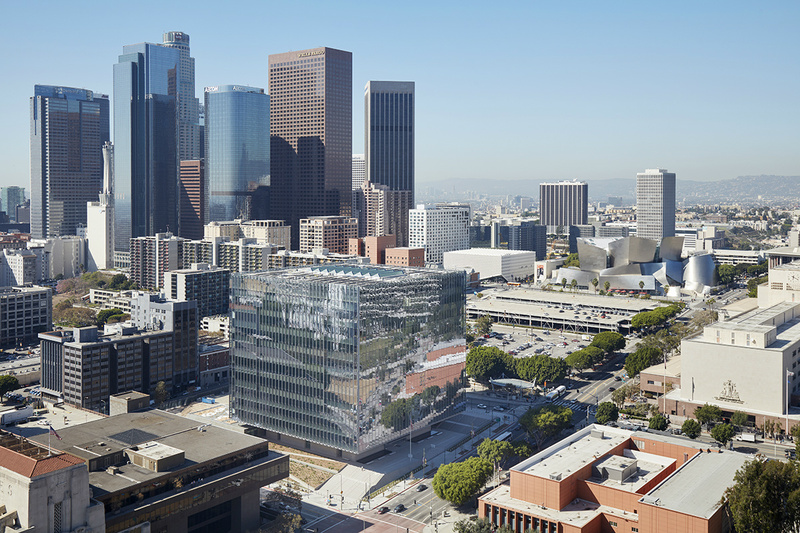 After being approved by their respective municipal bodies, a Los Angeles-area anti-development ballot measures isofficially heading to March 2017 ballot, raising many questions about the future of development and architecture in the region. The Los Angeles City Council voted unanimously in September to send that city’s Neighborhood Integrity Initiative (NII)—a measure that would, among other things, block certain kinds of new development in the city for two years and force the city to update its General Plan—to the ballot. The approval comes a few weeks after supporters of the initiative delivered the necessary 104,000 signatures to City Hall, setting in motion the official leg of what has already been a brutal and painful political slog in the city. The initiative is organized by a group known as the Coalition to Preserve Los Angeles (CPLA), itself primarily funded by the nonprofit AIDS Healthcare Foundation (AHF). The group contends that the region’s recent development boom has had adverse impacts on the lives of its patients, who, because of new development, must now struggle with more traffic and rising rents. The group’s initiative, adopting the anti-establishment tenor of the other so-called populist movements of this election cycle, takes aim at politicians and developers. The group’s literature and social media presence paint a vivid picture: Los Angeles as a dystopia made up of crooked politicians in cahoots with monied developers, with both groups exploiting the city’s hugely outdated General Plan for personal and political gain at the expense of everything else, “neighborhood character” especially. Amid the larger context of an intensifying regional homelessness crisis and the potential economic sluggishness resulting from high housing costs, one must ask which version of Los Angeles that the anti-development measures aim to preserve. One of the group’s central policy planks is the abolition of so-called “spot zoning” decisions, the types of lot-by-lot concessions working within contemporary Los Angeles’s outdated zoning code demands. 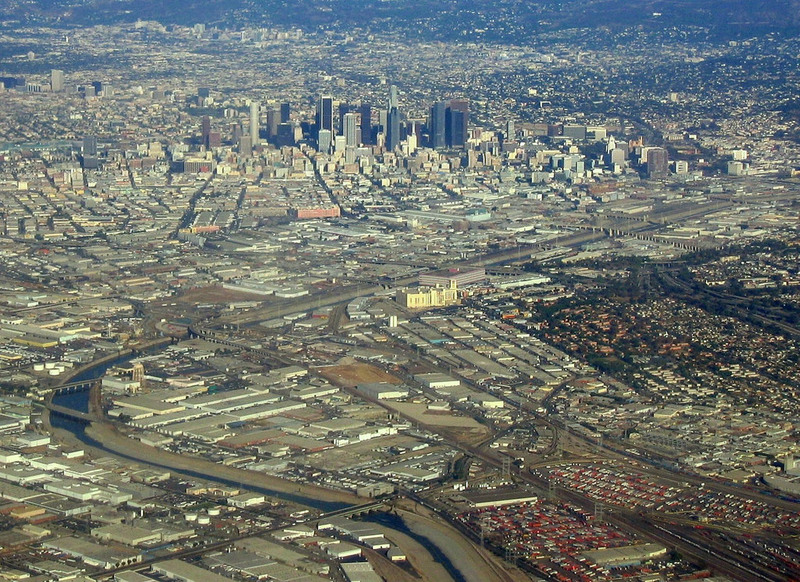 Because Los Angeles’s zoning ordinances and current General Plan have not been updated since the 1990s, many of the large-scale projects delivering housing infrastructure to the region—luxury, affordable, and supportive alike—require “spot” modifications to the code in order to allow for the higher density and height associated with their development. CPLA, in a press release, accuses the City Council, where “campaign cash, gifts, and donations” are exchanged openly, of being too cozy with these developers, saying that benefactor developers “are allowed to destroy community character and max out local streets and water mains” through their use of these spot zoning measures. Because the Los Angeles City Council has the power to approve and make demands of development projects that need spot zoning variances, the opportunity for crooked politics is certainly rife, but many across the region are asking if an outright moratorium on spot zoning isn’t too drastic of a response given the current conditions. And because high-density housing development is already relatively limited to certain pockets and enough housing has not been built overall, the region is also contending with a parallel gentrification and displacement crisis. The initiative is seen by the development community as a project-killer and in pro-housing circles as a threat to working class neighborhoods. Housing advocates argue that a halt in construction would further limit the development of affordable units in tow with the luxury projects the initiative seeks to curb, and push wealthier professionals into working class neighborhoods, displacing residents further down the economic ladder. 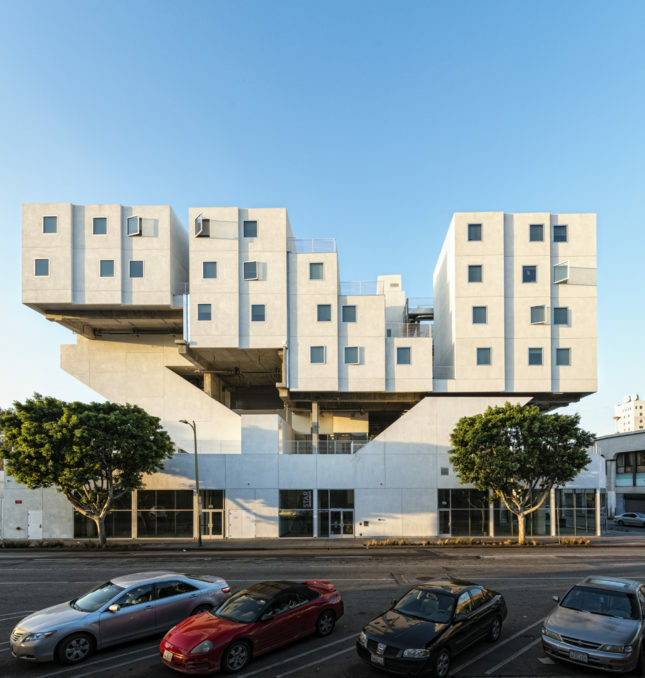 Michael Lehrer, principal at Lehrer Architects in Los Angeles, told The Architect's Newspaper (AN) via email, "The insidious effect of the new initiative will be a trickle down lack-of-housing. There will be less and less affordable housing, so that cheaper housing will be filled by people of more means. More people of lesser means will then become homeless." NII backers, though, have successfully peddled fear and suspicion through their campaign, bringing together an unholy alliance of Hollywood celebrities, anti-gentrification and working class advocacy groups, and wealthy landowners, blaming the skyline-changing projects for altering a perceived sense of “neighborhood character” and decrying the city’s “rigged development system.” These groups ignore the fact that the largest impediment to the city’s affordability lies not with luxury towers, but with an overabundance of single family homes and low-density zoning. If Los Angeles is to get more affordable, it must densify—not continue to spread out into the desert. Lehrer went on to say that restricting development as the NII proposes to do "radically restricts housing development. Legitimate concerns about lesser quality development must be answered with higher collective, legislative, and political leadership for design excellence and thoughtful urbanism and architecture that cherishes streets and quality pedestrian experience. That’s what we must always focus on and demand." In Santa Monica, the proposed Measure LV is on the Nobember 2016 ballot and would dole out even more draconian measures by requiring every building built taller than 32 feet in height to be put to a public vote. Regarding how anti-development initiatives like Measure LV would impact the ability of local architects to produce innovative architectural solutions that work toward alleviating the housing crisis, Julie Eizenberg and Hank Koning of Santa Monica—based Koning Eizenberg Architects told AN, “Requiring a public vote on buildings over 32-feet will inhibit any creative solutions in the development of multi-unit housing. Project budgets will stay the same, but the money currently spent on inventive solutions and creative design will instead be spent campaigning for a public vote. It’s a shame people are so afraid.” The Santa Monica ordinance would also upturn decades of civic progress for the beachside municipality that has a long tradition of mixed use development and pedestrian life. Worse still, the recently-opened Expo Line extension to the city from Downtown Los Angeles has reinvigorated the city’s potential for transit-oriented development; Measure LV would decapitate that energy with generational consequences. Koning and Eizenberg take issue with the relatively-low height threshold imposed by the measure, saying, “Under the current code, the maximum height that can be built by-right on most boulevards in Santa Monica is already 32-feet. Anything over that, up to a cap of 55-feet, goes through the Development Review Process that involves extensive public hearings. In most cases, we’re only arguing about 23-feet—but those feet make all the difference in terms of efficiency, cost-effectiveness, and housing creation." The Los Angeles chapter of the American Institute of Architects (AIALA) also recently came out against Measure LV, saying in a press release, “Measure LV ... is extreme, costly, and would result in devastating consequences ranging from haphazard planning, increased housing costs and decreased supply of affordable housing.” AIALA argues that the measure would undermine the city's Land Use and Circulation Element, a planning instrument already developed for Santa Monica via a “20-year-long democratic process.” The organization points out that Measure LV would hinder the development of housing units, overall, undercut the orderly planning approaches already in place through unpredictable voter approvals, lacks exemptions for public buildings like firehouses, and could also potentially limit the effectiveness of the city’s Architectural Review Board. L.A's measure, among several development-related initiatives that have gained traction this election year, will have to wait until the presidential election is over to have its test before voters. Deborah Weintraub has been awarded the 2016 Julia Morgan ICON Award for her outstanding contributions to the design industry as City of Los Angeles chief deputy city engineer. Weintraub is the highest-ranking architect in L.A. and is currently overseeing design work, project management, and construction management services for over 400 active projects totaling $3.5 billion, including Mia Lehrer + Associates’ proposal for the new FaB Park in Downtown Los Angeles, the Gehry Partners–led L.A. River restoration plan, Michael Maltzan Architecture’s replacement of the Sixth Street Viaduct, and HMC Architects’ proposal for the L.A. Convention Center. To Live and House in L.A.
Mayor Eric Garcetti aims to dedicate $138 million in funding to combat homelessness in L.A. Estimates for 2015 released by the Los Angeles Homeless Services Authority put Los Angeles County’s homeless population at 44,359 individuals, with 17,687 of the 25,686 homeless residents of the City of Los Angeles being completely unsheltered. On April 20, in what is being referred to as a call to arms across the city, Los Angeles Mayor Eric Garcetti announced that he had appropriated $138 million in funding aimed at addressing some of the needs of this vulnerable and marginalized population. A portion of the new funds—$86 million—is earmarked for the development of permanent affordable housing. Though the sum is vast, there are serious concerns regarding the viability of the proposal’s funding sources. Garcetti’s budget calls for the majority of the funds to be raised from linkage fees paid by developers, a set of fees that are not currently collected by the city. Should the L.A. City Council approve the mayor’s budget, it will have to instate new linkage fees as well. Simultaneously, homeless-relief advocates consider the $138 million sum a pittance of what is needed to seriously address the area’s entrenched homelessness issues, with many calling for a November ballot initiative to establish a permanent fund for the cause. Additionally in this election year, homelessness is being seen more widely as a phenomenon directly related to what some see as a rise in income inequality and endemic wage stagnation. With the state of California recently announcing a $2 billion plan to fund affordable housing for mentally ill citizens living on the streets statewide and the county of Los Angeles soon to put forth a plan of its own, one wonders if these efforts might finally begin to reverse the fortunes of tens of thousands of Los Angeles’s residents. Residential neighborhoods all over Southern California are losing their character as owners and developers exploit escalating land values. North Westwood Village, master-planned in the 1920s as a small-scale community of rental properties, has been particularly hard-hit. The North Westwood Village Specific Plan mandates harmonious development, but that requirement was ignored from the 1960s on, as hills were carved away and big-box student rooming houses overwhelmed neighboring properties and narrow, winding streets. Development was driven by the growth of UCLA and its behemoth medical center. The university (a state institution unhindered by local regulations) was the worst offender, constructing oversized faux-historic blocks and trashing modern classics by Richard Neutra and John Lautner. After a half century of abuse, the North Village has finally acquired an architectural gem, located across the street from Neutra’s landmark Strathmore Apartments. It required legal action by a neighborhood association to compel the developer to abandon the eyesore he had proposed and commission a new design from Lorcan O’Herlihy Architects (LOHA). The challenge was to fit 31 units (totaling 37,000 square feet) onto a narrow, tilted wedge of land, stepping down from six to two stories in deference to Neutra’s design, a garden court of eight units terraced up a steep slope. 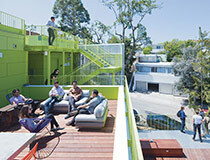 The strategy reprised LOHA’s Habitat 825 on Kings Road in West Hollywood, where the site was excavated a story so that the new block would not overshadow the garden of Schindler’s classic studio-house. The “luxury” condo towers along nearby Wilshire Boulevard and the dingbats on every side street are essentially alike: warrens of rooms and internal corridors, sealed off from nature and the street. 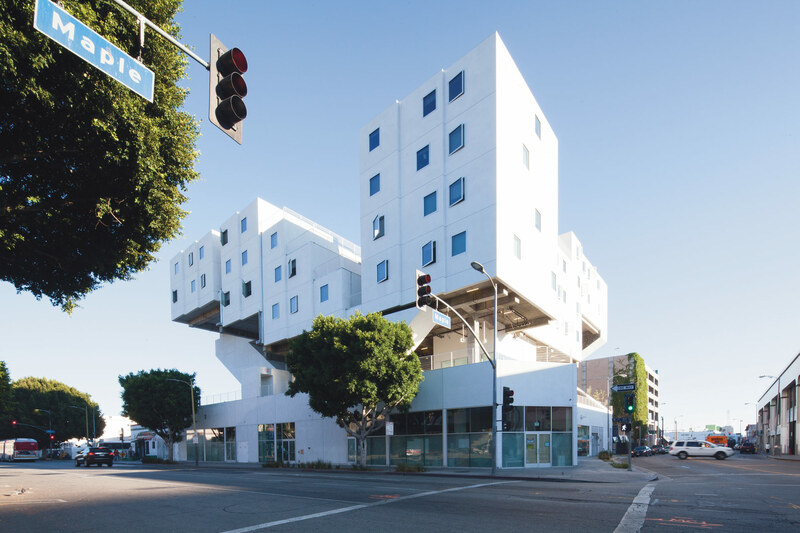 LOHA’s works stand in contrast; two of the firm’s condo blocks in West Hollywood are set back from pocket parks, blurring the divide between public and private, and creating shared spaces that benefit the community as well as the residents. “On Strathmore we asked ourselves, ‘What if we cut into the box and landscaped the different roof levels, allowing residents to engage the outdoors?’” said O’Herlihy. That’s a concept as old as the Native American pueblos of the Southwest and the roof gardens of North Africa and the Middle East, but one that has been largely forgotten in the most developers’ rush to exploit every foot of rentable space. With Studio 11024 on Strathmore, the architects go further. The city mandates a 50-foot wide view corridor through a block that is more than 150 feet long. LOHA reinterpreted this rule to create a linear divide, which accommodates outdoor walkways and stairs linking three roof gardens, and reduces the need for double-loaded corridors. Half the apartments have opening windows on two sides for abundant natural light and cross ventilation. Most L.A. houses and apartment buildings are faced in stucco, all too often in beige tones. LOHA had used metal facing panels on previous jobs—Formosa 1140 in West Hollywood was clad in fire engine red. Though the budget was tight, they discovered the structure could be clad in ribbed, white enameled aluminum panels for only a few dollars a square foot more than a standard stucco finish ($16 versus $13). The panels are deployed on the two street facades in tiers of differently sized ribs. Those variations break up the mass of the conjoined blocks and the sheer planes serve as screens to capture crisp patterns of sun and shade. Lateral cuts serve as backdrops to the roof terraces and are clad with Hardie board, layered in six tones of yellowish green that become lighter as they ascend. The white echoes the Neutra and several neighboring blocks and responds to changes of light. 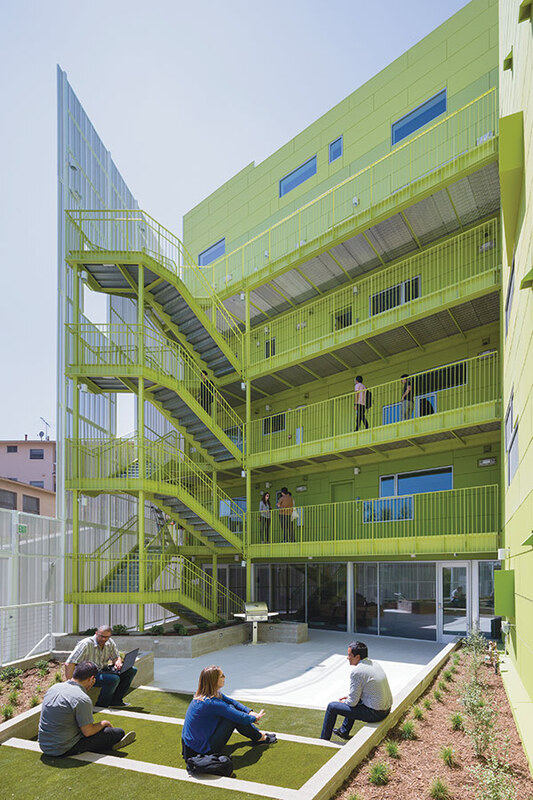 Handrails and metal staircases pick up on the green walls, which introduce a vibrant new element into the townscape. They even inspired another property owner to repaint a faded pink block in forest green. Perforated white metal panels screen the staircases, teak benches divide up the terraces, and the sharp edges are softened by landscape architect Mia Lehrer’s generous plantings. Nearly all L.A. apartment blocks are as repetitive as a motel, but LOHA insist on diversified interiors, ranging from studios to lofts. O’Herlihy—like architects Michael Maltzan, Kevin Daly, and other contemporaries—understands that a younger generation wants to break free of the conventional layouts imposed on earlier generations. On Strathmore, the two- and three-bedroom apartments were configured by the developer’s interior consultant, but the plans are varied, and there are three duplex apartments on the fifth floor. Studio 11024 is a deceptively complex building with well-varied fenestration that responds organically to the shifts of elevation and orientation. 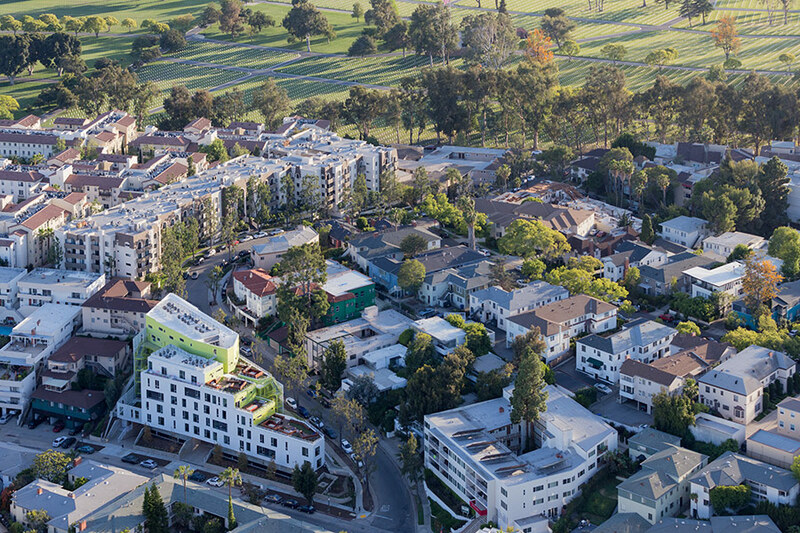 It raises the bar for Westwood Village and shows how architecture adds value for the owner, tenants, and neighbors. Ideally, it will not become another student rooming house, but will attract a lively mix of residents, and encourage other developers to aim higher, hiring talented architects rather than docile hacks. It should also stiffen the resolve of the Westwood Community Design Review Board, which rejected the previous scheme and enthusiastically supported this, but has sometimes been too tolerant of mediocrity.